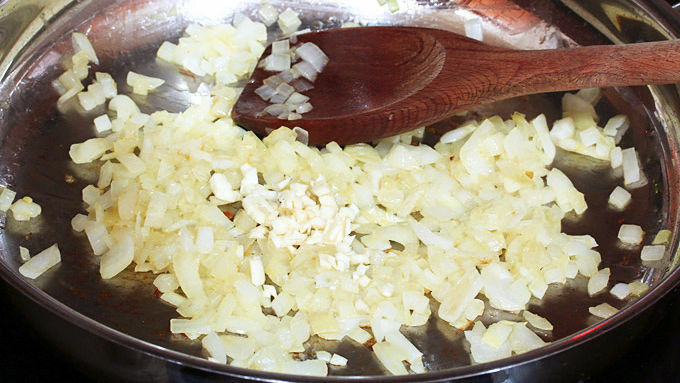 Heat the olive oil in a skillet over medium-high heat and cook the onions until soft and transparent, 5-7 minutes. Add the garlic and cook for another minute. 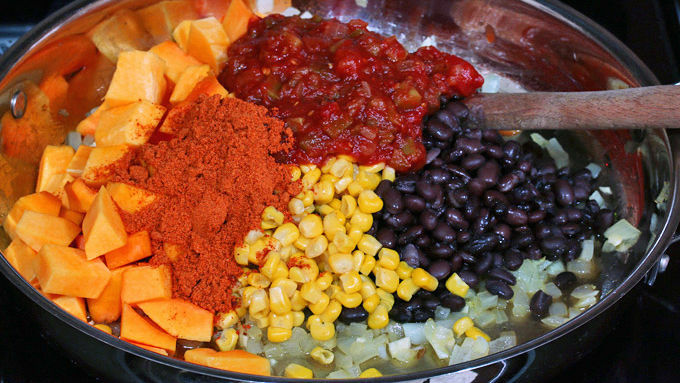 Add the beans, corn, salsa, butternut squash, water and seasoning mix. 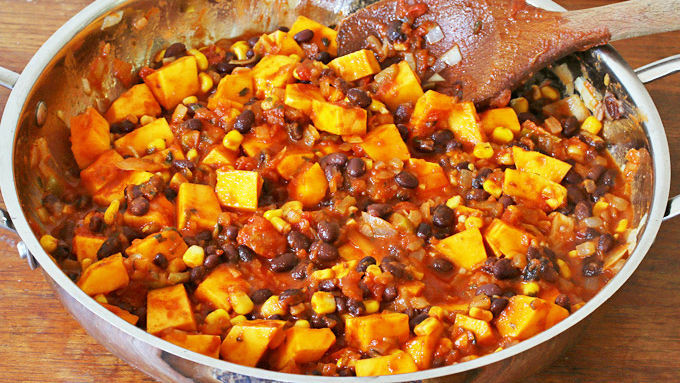 Simmer for 25-35 minutes or until the butternut squash is soft. 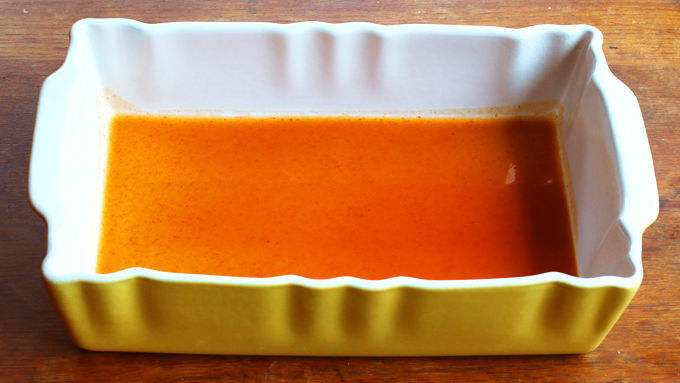 Spread about 1/4 cup of enchilada sauce along the bottom of a 9x13-inch casserole dish. 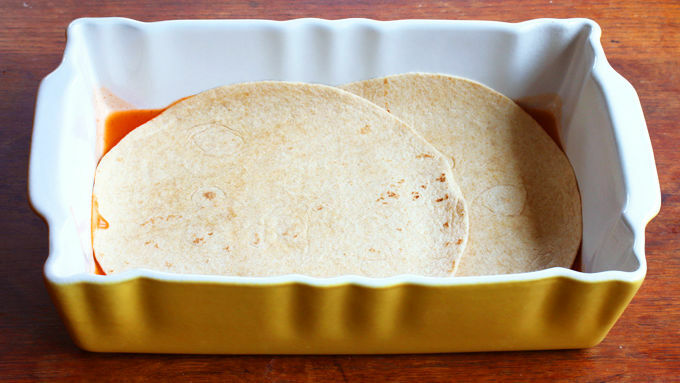 Lay 2 tortilla shells over the sauce so they touch the ends of the dish and overlap each other in the middle. Spread half of the filling over the tortillas, then pour half of the remaining enchilada sauce over it, then sprinkle with cheese. Repeat the layers; place two more tortillas over the cheese, add the remaining filling, pour the remaining enchilada sauce over, and top with the remaining cheese. Cover with aluminum foil and bake for 30 minutes. Uncover and bake for another 8-10 minutes or until the cheese is melted and bubbly. Let sit for 5 minutes before serving. Garnish with sliced green onions and chopped cilantro. Serve with sour cream if desired. 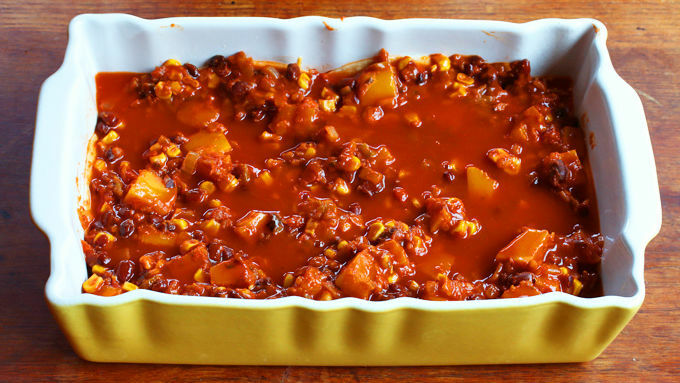 With layers of Mexican flavors and melty cheese, this vegetarian casserole is one even meat-lovers will want to try! 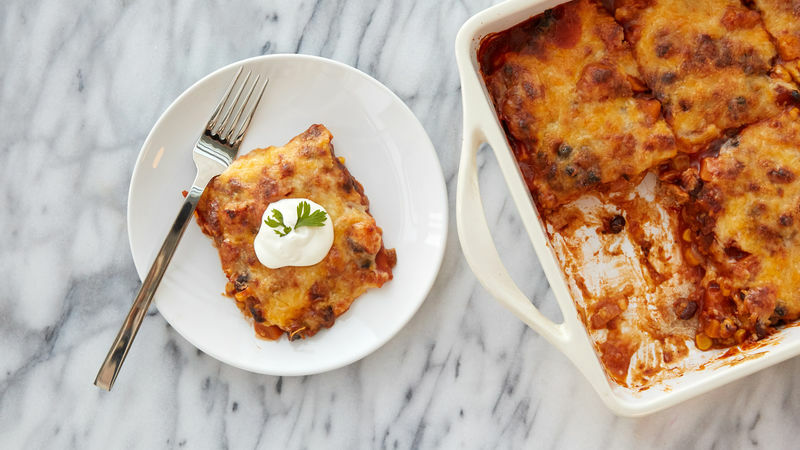 Easy to assemble and quick to the table, this enchilada casserole is everything dinner was meant to be. I love casseroles. They're a complete meal in one simple dish and they always spell c.o.m.f.o.r.t. 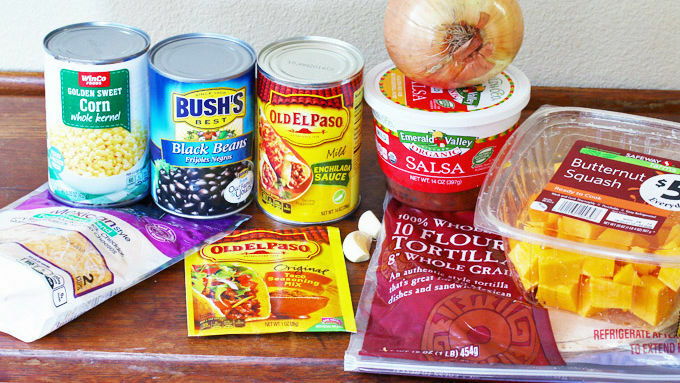 And what could be a better comfort food than a Mexican casserole? Better yet, a Mexican casserole that not only tastes amazing but is packed full of ingredients that will nourish both body and soul. My casserole was inspired by skinnytaste.com's fantastic recipe. Whole wheat tortillas are layered with black beans, corn, salsa, butternut squash, spices and oozing with cheese... this is a meatless casserole that even the most passionate carnivores will love! It's super easy to put together. Using pre-cut butternut squash (found in the refrigerated section of the produce aisle) saves time and effort. The meal prep is simply a matter of adding the ingredients to a saucepan to simmer with the seasonings and then layering them between the tortilla shells. It's that simple. This is also the perfect make-ahead meal. Assemble everything, then cover and refrigerate until you're ready to bake it. Voila! 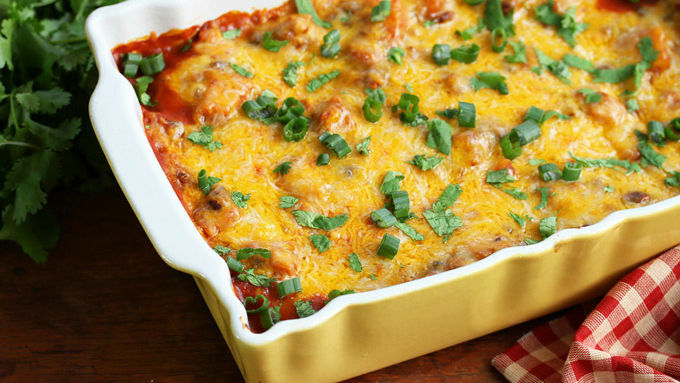 A delicious Mexican-style casserole that will have your taste buds dancing the salsa!